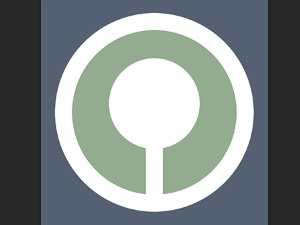 I'm going to resize a new potential Dreevoo logo. 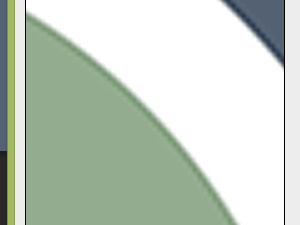 Size of my document is 350 x 350 pixels. 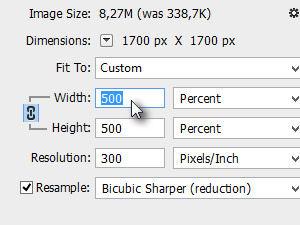 In the new Image Size settings window select Percent and the select 500 as the Width. 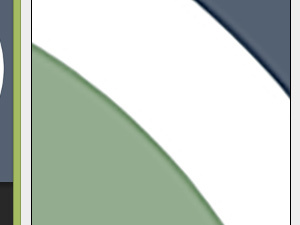 Height will change itself automatically and proportionally to the original image. Now click the image on the area where you want to check the details of (see picture). 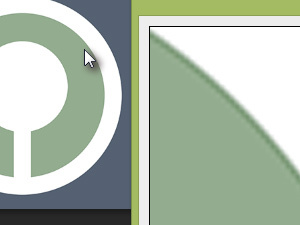 In my case, the 500% resize I chose made the edges too blurry. 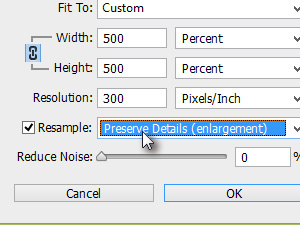 Now enable the Resample and choose the Preserve Detail (enlargement) option. Now this is a whole new Photoshop CC feature. 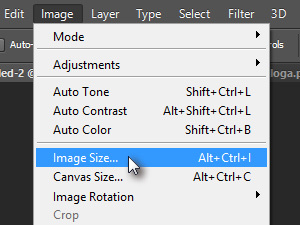 You could set it to Automatic as well, but later on try and use the Reduce Noise, option which helps you smooth the edges when you want to make the image larger. Don't expect miracles though, non the less, the updated Image Size tool really is a big step forward.